One of my oldest percussion affiliations is with the legendary master, Candido Camero. In 1958, while I was still in college and working on my engineering degree, I had the opportunity to hear Candido, in jam sessions, at Birdland. This brief exposure was enough to shape my career as a designer and builder of professional percussion instruments. Candido was one of the first percussionists who brought conga drumming to both jazz and pop music. He is also credited for introducing the use of two and later three congas. Prior to this, percussionists used a single drum. He was also the first conguero to use the fiberglass conga, thus helping to commercialize this product. Candido has played and recorded with such greats as Tito Puente, Dizzy Gillespie, Billy Taylor, Tony Bennett and countless others. He is one of my greatest inspirations, not only because of his immense talent but because of his strong sense of personal ethic. I've never known a person that has had anything but great things to say about this honest and humble man. This is certainly not my sentiment alone: recently ASCAP hosted a documentary film, "Candido: Hands of Fire" by Ivan Acosta, which illustrates Candido's incredible career. 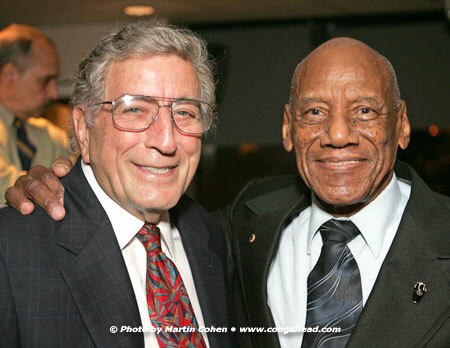 Among the hundreds that attended the film's screening was Candido's good friend, Tony Bennett, who gave a heart-warming testament to Candido's musical talent and genuine and loving personality. Whenever Candido performs, he always thanks LP and me for providing him with the white drums that have become his trademark: the LP Original Model Congas in fiberglass. In Candido's own words, "The sounds are pure and clear and they inspire my feelings and my soul."